The removal of the slaughterhouses from Sussex-street and from Blackwattle Swamp has already effected great improvement in those parts of the city, both in doing away with the offensive and noxious odour arising from the operations, and also in pre-venting the frequent accidents which have arisen from the escape of infuriated cattle from the yards. Some idea of the extent of his pastoral activities, which in part provided stock for his butchery business, can be seen from his lease holdings in a 12-month period, 1866. Below is a Table of just some of his leased properties for that year and he clearly had others not here listed. Livestock and rural properties were not his only property interests as he also owned many properties in the city of Sydney. In 1896, he owned some 90 properties, 75% were houses and 24% were shops with less than 1% being land. Neale invested in income-producing holdings that produced for him significant rents. He also, unlike his father, owned several public houses from 1861 until 1863 and probably for much longer. At one time, he owned the Prince of Wales Theatre and the block of buildings in which it stood and was its mortgagee when it burnt down. 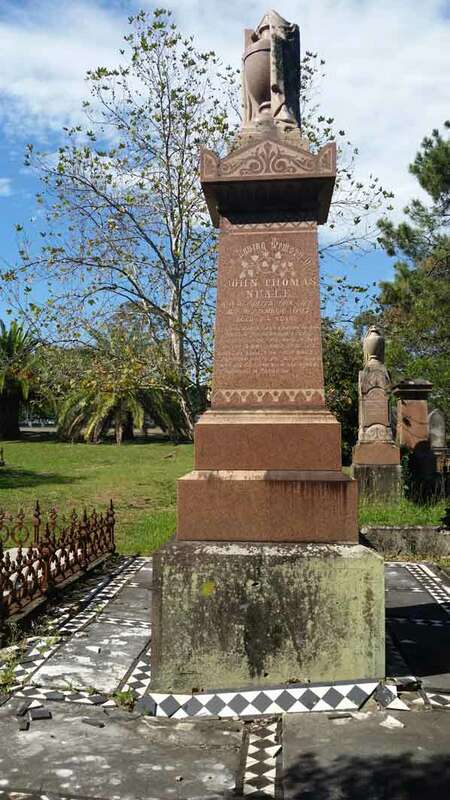 He also invested in various companies being the largest shareholder in the Commercial Banking Company of Sydney, a large shareholder in the bank of New South Wales, the United Insurance Company, Richardson and Wrench and many other financial institutions. Neale was involved in numerous partnerships of a commercial nature such as in Peisley and Neale in stock purchases and in a Wool Scouring Works at Collingwood, Liverpool, in conjunction with JH Atkinson. In 1848 Neale, in partnership with others, sought to develop the iron ore (Limonite) deposits at the Ironstone Bridge, Mittagong, proceeding to commence smelting operations. A company was formed in September 1851 but Neale, perhaps not convinced of financial return from the venture, did not become a shareholder. In the longer term, his decision proved to be correct. Eventually, Neale focussed on becoming a financier or money lender and through this role he became very wealthy. As one trusted friend said of him ‘he could not help making money’and is meant to have commented to a friend that ‘he could live very comfortably upon the interest of his interest’. With an underdeveloped banking system, private financier’s such as Neale could carry on a significant business. He lent large amounts of money to Municipal Councils for infrastructure works such as £1,000 to the Waratah Council, £10,000 to the West Botany Council, £4,500 to East Maitland for the development of gas works, and £10,000 to Paddington Council to pay off other loans. 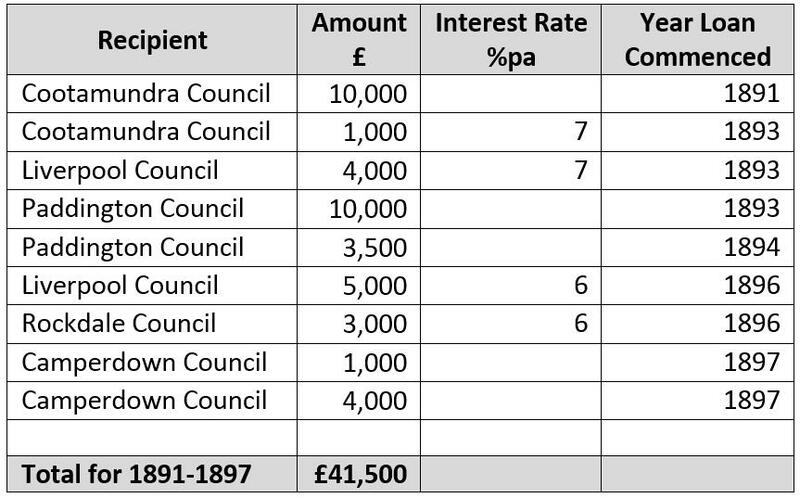 A significant number of these loans by Neale were through a tender process so his terms must have been very competitive. Significantly, he was able to take advantage of the economic downturn in the 1890s and lent to various municipal councils. He no doubt also loaned for private mortgages, but these only came to public attention when, through default, court action was required for debt recovery. At his death, he was one of the largest municipal debenture holders in the colony and was said, probably with some exaggeration, to have held a thousand mortgages. Neale was interested in cricket and he and his brothers were involved with the Orwell Cricket Club whose ground was at Paddington. He was said to be at one-time president  and certainly his brother James was presented with a bat for services to the club as Honorary Secretary in 1863. In 1864, in a match against the Registrar General’s Office, a J Neale (was it JT or JH Neale or someone else?) took six wickets in the first innings but scored only two runs. For the record, despite Neale’s great bowling effort, the Registrar General’s Office won easily. John was involved in the NSW Cricket Association and was a large shareholder in Sydney (Association) Cricket Ground. He was a committee member and helped raise funds for Charles Lawrence, the coach of the Aboriginal Cricket team, to tour England. Over his lifetime, Neale did not take an active interest in politics. He did, however, stand for election to the Sydney Council and was elected in April 1857 as an Alderman for both Phillip and Denison Wards. He topped the poll by a wide margin and did so again in December of 1857. He served until November 1859 when he did not stand for re-election. it is but a just and fitting tribute to the private worth and unblemished reputation of Mr Cowper, whose best years have been devoted to the service of the colony; and who (however mistaken at times) has been, and ever will be, recognised as one of the ablest statesmen that has presided over the destinies of this great empire to be. John Neale, John Thomas’ father, was deeply involved in the Sydney Total Abstinence Society, sharing in its establishment in 1838, and later both as its President (1842-3) and its Treasurer (1840-3). 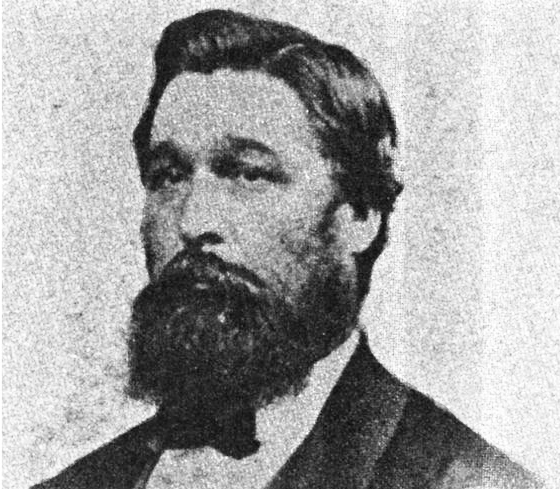 His son Alfred (1825-1906) and probably his nephew Robert were also involved in the movement, but there is no evidence that John Thomas was a member. It seems that John did not maintain such views as he was the owner of numerous public houses. His contributions to the Circuit and Trust Funds were constant and systematic… One of his last acts of generosity, on hearing that an effort was being made to liquidate the circuit deficiency, was to hand the minister a cheque covering one half the required amount; and among his charitable bequests the Trustees gratefully notice the sum of £2000 to reduce the debt on the Church. That the William Street church was the subject of significant bequests by both John and Hannah would suggest a level of interest, if not commitment, in its mission and work. While this does explain the need for the bequest the reason is probably supplied by the fact that Colonel Rowe had been the foundation Sunday School superintendent at the Dowling Street Wesleyan Church and the William Street Wesleyan Church for over 17 years. The Rowe and Neale families knew one another from that context. Colonel Rowe attended JT Neale’s funeral and it seems that they were probably friends. Each month on Sunday afternoons, from sometime after 1885 and at the William Street Church, Hannah would make it possible for some 50 copies of the ‘Glad Tidings’ to be distributed among the William street cabbies who carried passengers with their horse-drawn cabs. In 1899, she donated some £500 to the William Street Church’s contribution to the Methodist Church Century Commemoration Fund. Putting aside the inheritances and gifts given to family and friends, an examination of the Neale bequests reveals similar characteristics about the two bequests which were made some 14 years apart with those of John preceding those of Hannah. Firstly, in terms of value, the bequests of Hannah far exceed those of John both in total amount given (£47,500/£18,500) and in the amount given in individual bequests. For example, both left money to the Sydney Hospital, John £3,000 and Hannah £6,000 but, as in all the amounts left, they are significant sums of money and would have been very helpful to the recipients. In terms of total estate, the bequests of Hannah also far exceed those of John; Hannah gave some 6.2% of her estate to charity whereas John gave 2.3%. Secondly, Hannah’s list of recipients is mostly the same as those of John. John gave 13 separate bequests and Hannah 15. 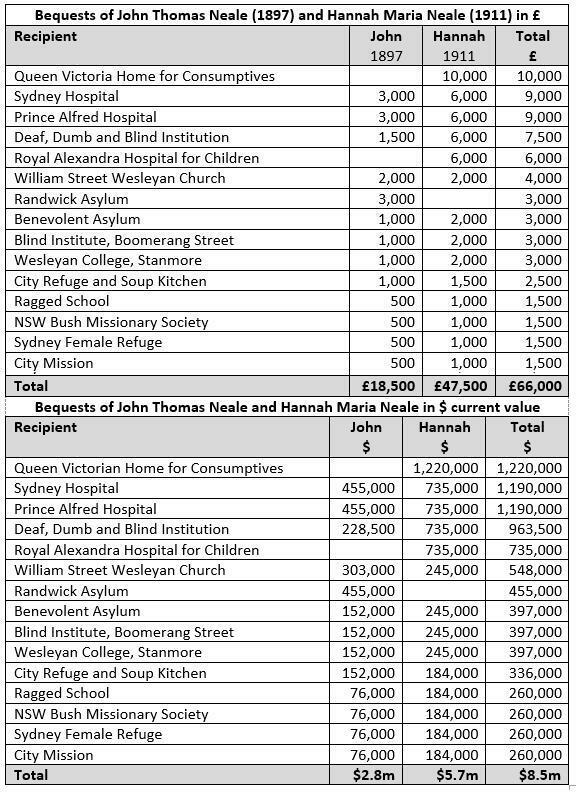 The differences in the lists are that Hannah does not give to the Randwick Asylum but adds the Queen Victoria Home for Consumptives and the Royal Alexandra Hospital for Children. 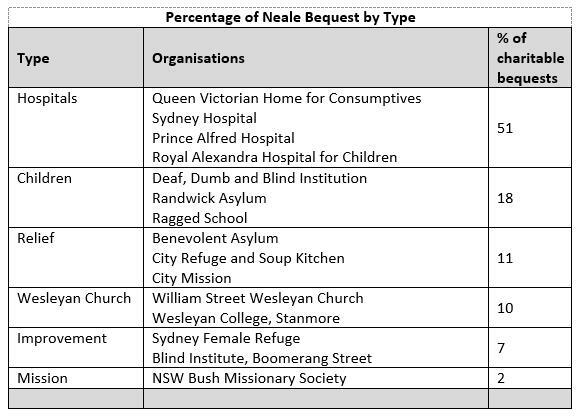 Thirdly, the distribution of the bequests displayed a preference in the Neales’ charitable interests. Hospitals receive the greatest percentage of their giving (51%), next come children’s charity (18%); Relief (11%); the Wesleyan Church (10%); Improvement (7%) and Mission (2%). There are different ways of classifying the organisations that received bequests which would alter the percentages but not change the trend detected in the Neale bequests. Without question, their giving favoured those organisations building community facilities (hospitals) and clearly the childless couple also gave a significant proportion of their wealth for the benefit of children. While the Church received a biblical 10% (was this deliberate or accidental?) another 2% was given for mission both of which were support for organisations seeking to propagate the Christian faith. Fourthly, the bequests were largely to organisations they already supported. Records are fragmentary for the various charities, but John regularly supported the Society for the Relief of Destitute Children and the Randwick Asylum from the first time he gave a £50 donation in 1857. This donation was the proceeds of a court decision against Inspector M’Lerie for John’s wrongful arrest over an allegation of cattle stealing and bestowed on him the status of a life Director. John also supported the Ragged Schools at least from 1864 and Hannah the Sydney Female Refuge from 1865. The Neales supported the Deaf, Dumb and Blind Institution almost every year from 1864 until 1910. As this organisation is the only one of those supported by the Neales to have a full set of records, it could well be that the consistency of the Neales’ pre-bequest giving to this cause was replicated in their other charitable interests as well. In 1897, the year of his death, John donated £200 and Hannah donated £200 in 1899 for the proposed home for consumptives (Queen Victoria Home for Consumptives). The Prince Alfred Hospital received £20 from John in 1868and Hannah gave £500 in 1904 to the Royal Alexandra Hospital for Children. She also supported the Sydney Female Refuge from at least 1865 until 1899. DEATH IS SWALLOWED UP OF LIFE. Others had a different view of Neale for financiers, like bankers today, were subject to harsh criticism by some, but it is difficult to see whether such nineteenth-century criticism was justified. They provided a much-needed service, charged a fee, and when payment was not forthcoming would seek to foreclose on the asset which had been put up as security for the loan. 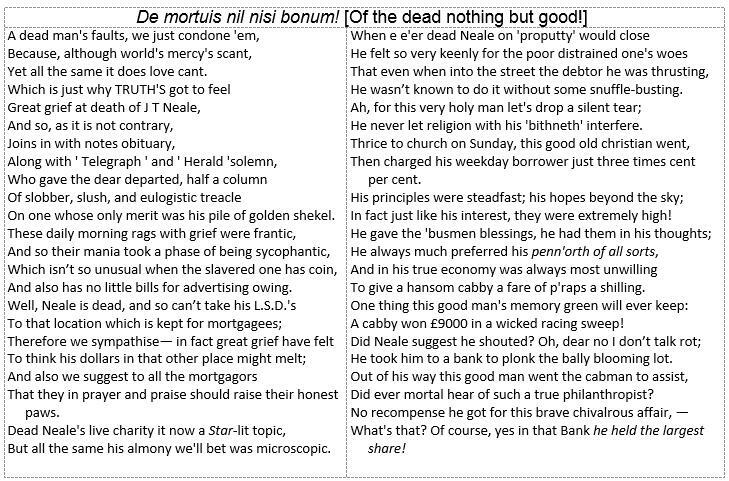 The reviews on John Neale’s life were mixed; he was praised for business success and for the bequests he made, yet for others in the more radical press he was a hypocritical, money loving, greedy mortgage vampire. all his transactions were of the cleanest and most honourable kind, and wherever he loaned – and he did so in many of the municipalities of the State – he only received the current rate of interest, 4 ½ per cent or so. His liberality and his acts of kindness to persons in need were almost beyond calculation. His assistance took regular and systematic, rather than spasmodic or intermittent, forms; but in a characteristic spirit of unostentation, he never allowed his charity to be made public, and his name rarely figured on a subscription list. His frequent gifts to the poor and needy were always in a generous, kindly spirit, and free from all ostentation. He lived to give by stealth, and many of his benefactions were never made known to the public. As proving the saintly charity and general blessedness of the late lamented (by the ‘Herald’ and ‘Telegraph’) J. T. Neale, who put up for £375,000 or so, this office has been besieged by starving widows, who have laid their husband’s death and their children’s ruin and starvation to old Neale’s vampire greed as mortgagee. Benevolent? Be damned! 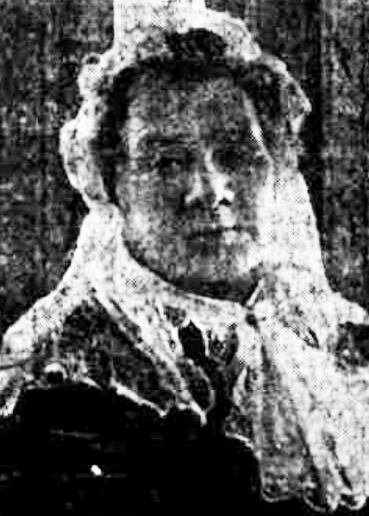 Mrs Neale, who died last week at her residence, Macleay-street, Potts Point, left £50,000 to be divided amongst charitable institutions, Catholic organisations excluded. It is unlikely that John Neale was either as virtuous or as vile as portrayed. From this historical distance, there is simply not the evidence to sustain a case either way. That he only charged ‘4 ½ per cent or so’ was somewhat inaccurate as his rates did sometimes go as high as 6.35 or 7%. It must be said, however, that much of his loan business was done by tender so his rates for those loans must have been competitive and in line with market expectations. There is no evidence of a harsh policy of eviction by Neale. On private loans, it may have been so, but due to a lack of sources such a judgment cannot be sustained. Such loans only come to notice where court action was needed to be taken so a ‘husband’s death and their children’s ruin and starvation to old Neale’s vampire greed as mortgagee’ may just be inaccurate and untrue hyperbole. While there were private loans they were by nature private and what loans are known were public ones to various local government bodies. As to his charity, it does seem that it was as suggested: unostentatious and systematic and regular. The reason this can be confirmed is that it is not true that in his giving ‘he never allowed his charity to be made public, and his name rarely figured on a subscription list’. While he may have given much in private he did give as others did to various organisations and to their collectors and consequently his name would appear in their acknowledgements in the newspapers and in the annual reporting of subscription lists. men who leave vast sums in this way may fairly be thought men who would not have left it at all, had they been able to take it with them. The memories of such cannot be held in grateful remembrance, for there is no grace in their gifts. Whether Carnegie’s comments apply to the Neales is an open question. While they did give in their life-time such giving could be interpreted as responding to a community expectation placed upon those who were rich rather than as an expression of a philanthropic character. The Daily News (Perth, WA), October 26, 1897, 3. Values in 2011 $ calculated according to the latest Year Book Australia 2012 figures e.g. Current value = £ value x2x2011 CPI value/CPI Number for year of donation. 16 September 1897. Australian Town and Country Journal (Sydney, NSW), September 25, 1897, 45. Sydney Morning Herald (SMH), March 23, 1911, 8. SMH, November 17, 1843, 1; March 18, 1852, 4. N. Whitlock & J. Bennett et al, The Complete Book of Trades (London: Thomas Tegg, 1842), 81. Australian Town and Country Journal (Sydney, NSW), September 25, 1897, 45; Sunday Times (Sydney, NSW), June 7, 1914, 2. SMH, October 22, 1860, 5. 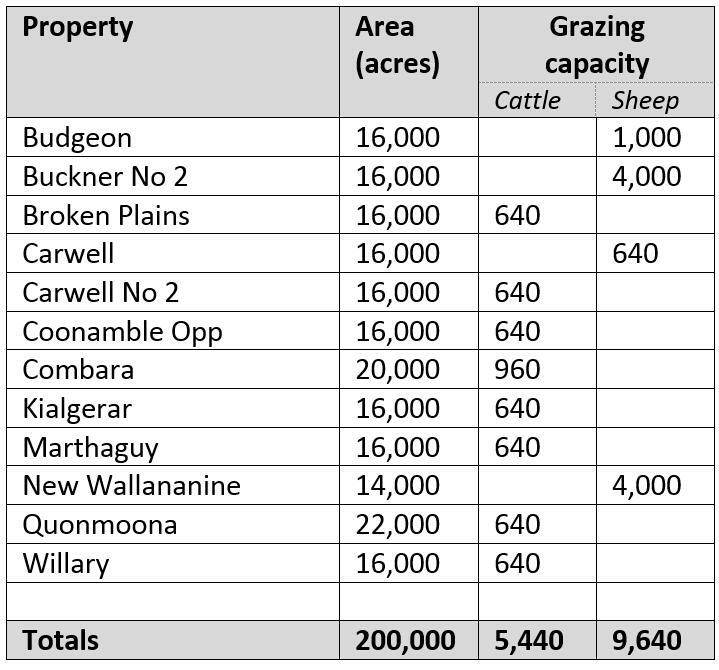 See Ray Christison, Coonamble Shire Thematic History, High Ground Consulting, 2009, 53 for the names of other properties under lease to Neale in 1865. Bailliere’s New South Wales Gazetteer and Road Guide (Melbourne, 1866); Wellington Times (Wellington, NSW), February 22, 1917, 3. SMH, June 21, 1861, 7; Goulburn Herald (Goulburn, NSW), October 10, 1860, 4. Australian Town and Country Journal (Sydney, NSW), September 25, 1897, 45. Empire (Sydney, NSW), December 19, 1856, 1. Cumberland Argus and Fruitgrowers Advocate (Parramatta, NSW), March 6, 1915, 5. SMH, December 12, 1848, 2. R. Else Mitchell, ‘Mittagong and District – Its Industrial Development’, Journal and Proceedings of the Royal Australian Historical Society, 26 (5), 1940, 418-422. Daily Telegraph (Sydney, NSW), March 25, 1911, 13. The Maitland Daily Mercury (Maitland, NSW), May 12, 1894, 2. Evening News (Sydney, NSW), October 29, 1887, 6. Newcastle Morning Herald and Miners’ Advocate (Newcastle, NSW), August 20, 1890, 3; Northern Star (Lismore, NSW), October 22, 1887, 4. Evening News (Sydney, NSW), April 25, 1899, 4. Goulburn Herald (Goulburn, NSW), September 22, 1897, 2. The Cumberland Argus and Fruitgrowers Advocate (Parramatta, NSW), September 18, 1897, 1. SMH, June 19, 1897, 10. SMH, October 7, 1863, 5. SMH, December 12, 1864, 4. SMH, October 17, 1863, 5; Empire (Sydney, NSW), October 28, 1864, 1; Goulburn Herald (Goulburn, NSW), February 28, 1863, 3. SMH, January 27, 1868, 1. SMH, December 3, 1859, 7. SMH, May 7, 1866, 1; Sydney Mail (Sydney, NSW), May 5, 1866, 2. Bell’s Life in Sydney and Sporting Chronicle (Sydney, NSW), May 5, 1866, 3. The Sun and New South Wales Independent Press (Sydney, NSW), May 6, 1843, 2. The Teetotaller and General Newspaper (Sydney, NSW), November 23, 1842, 1. Sydney Herald (Sydney, NSW), November 28, 1840, 2. The Methodist (Sydney, NSW), October 2, 1897, 8. Empire (Sydney, NSW), December 14, 1859, 1. The Methodist (Sydney, NSW), January 26, 1918, 5. Empire (Sydney, NSW), August 2, 1864, 5. It closed in 1870. SMH, June 18, 1870, 2. 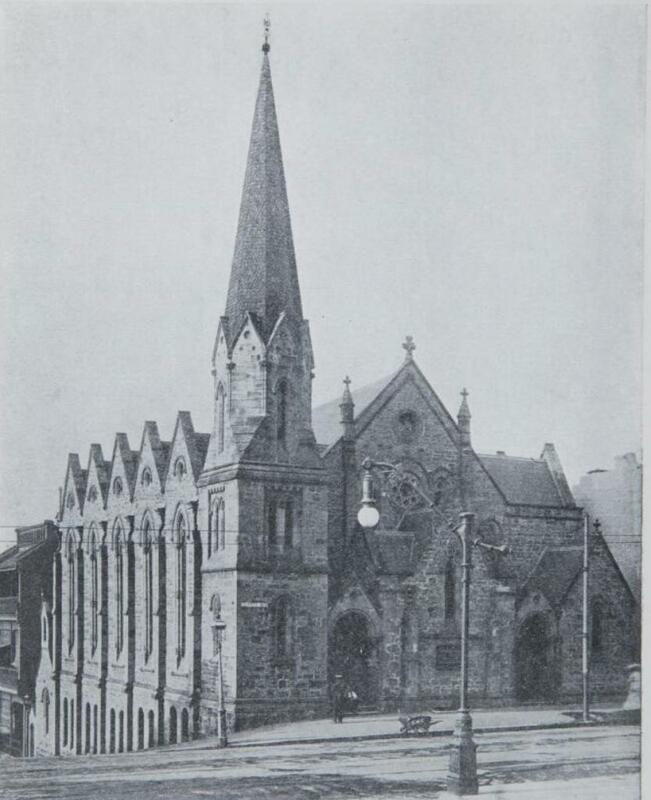 Thomas Rowe Sunday School Superintendent of Dowling Street was the chairman of the Board. The Methodist (Sydney, NSW), July 15, 1933, 10. J. M. Freeland, ‘Rowe, Thomas (1829–1899)’, Australian Dictionary of Biography, National Centre of Biography, Australian National University, http://adb.anu.edu.au/biography/rowe-thomas-4517/text7391, published first in hardcopy 1976, accessed online 5 March 2018. Australian Town and Country Journal (Sydney, NSW), January 21, 1899, 21; The Methodist (Sydney, NSW), January 28, 1899, 1. JT Neale paid for a tea for the Sunday School at Dowling street for the Bible presentation to the Prince Alfred. Sydney Mail (Sydney, NSW), July 25, 1868, 4. Evening News (Sydney, NSW), September 18, 1897, 6. The Methodist (Sydney, NSW), February 2, 1918, 3. Glad Tidings was a Sydney Christian publication begun in 1885 and devoted to recording and spreading the good news of full salvation. The Methodist (Sydney, NSW), August 5, 1899, 8. SMH, July 25, 1857, 1. He annually gave £5 from at least 1873 – 1886. Waugh’s Australian Almanac, 1860, 197; Sydney Mail (Sydney, NSW), March 10, 1866, 3. SMH, May 2, 1885, 5. Annual Reports of the Deaf, Dumb and Blind Institute 1863-1911. There was a short hiatus in support in the years 1873-1878. The Daily Telegraph (Sydney, NSW), May 20, 1897, 3; Evening News (Sydney, NSW), August 28, 1899, 4. SMH, April 9, 1868, 8. SMH, December 24, 1904, 8. Sydney Female Refuge Annual Reports 1865, 1868, 1871, 1874, 1876, 1879, 1880, 1887, 1888, 1899. Truth (Sydney, NSW), October 3, 1897, 1. Freeman’s Journal (Sydney, NSW), March 30, 1911, 17. Andrew Carnegie, ‘Wealth,’ North American Review, CCCXCI (June 1889):4. http:www.swarthmore.edu/SocSci/rbannis1/AIH19th/Carnegie.html [accessed May 31, 2011]. By phinaucohi in Philanthropy on July 16, 2018 .